Grain flowing from the Dakotas and Western Minnesota to Duluth’s and Superior’s mammoth grain elevators in the 1880s made the Twin Ports a natural spot for flour mills to flourish. 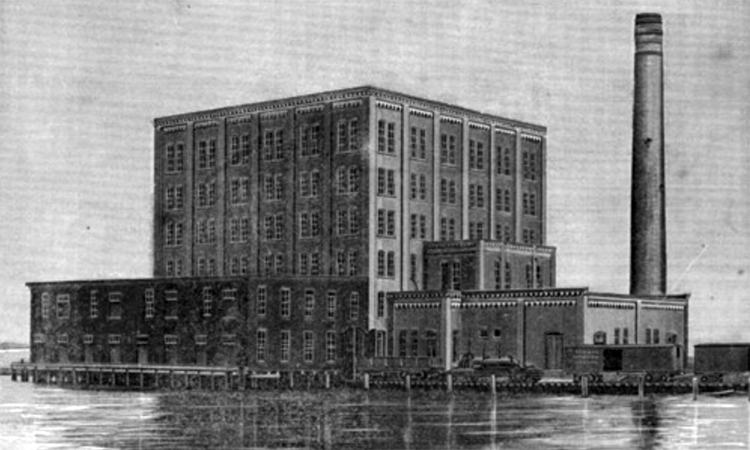 In 1889 pioneer Roger Munger partnered with Bradford C. Church and T. A. Olmstead and established Imperial Mills on the east side of Rice’s Point at 600 Garfield Avenue. It would become the largest such operation on the planet. While Duluthians had been milling flour for years at a modest capacity, the Imperial Mill—built with what was then considered an experimental design—was considered “the most complete ever built” and at six stories high was by far the largest in the Twin Ports. With crews working day and night, Imperial could pump out 1,500 barrels of flour each day in its new mill, which ran on the power supplied by a 600-horsepower Reynolds-Cross steam engine. By the end of 1889, the facility had increased production capacity to 8,000 barrels a day, an earmark its owners claimed surpassed “previous records of all other flour mills in the world.” That year Imperial built wooden grain elevators #4 and #5. 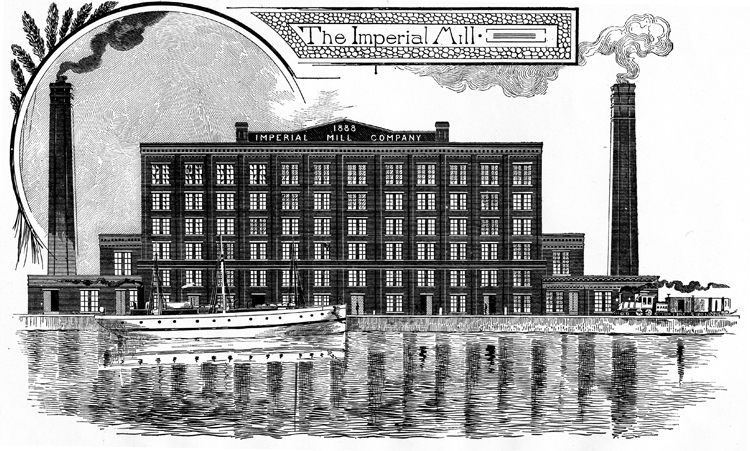 By 1892 Imperial was the largest flour mill in the world, actually producing 6,300 barrels a day. Red River wheat was delivered to the mill on railroad tracks, shoveled into the mill on one side and rolled out as flour in barrels on the other, loaded straight into vessels docked along slip #1. It wasn’t all smooth sifting: the company was faced with labor issues, including a stoppage of production in 1892 when its packers went on strike in sympathy of protesting coopers, who made the barrels they filled with flour. In 1894 Imperial added to its complex by erecting a barrel factory 150 feet from the mill, hiring coopers to make the company’s own barrels, the first mill in the region to take this step to self sufficiency. It didn’t help with the labor issue: in 1895 the coopers union called for a boycott of Imperial products because they made their barrels with non-union labor. It took until 1898 to settle the matter. When the Pillsbury mill soon after claimed 9,000 barrels a day, their Duluth counterparts implied that the Minneapolis millers had cheated. Two years later Charles Pillsbury himself challenged Imperial Mills and another rival, Minneapolis’s Washburn-Crosby Mill, to settle once and for all which mill had the greatest production capacity. The question was rather silly: all three mills had the capacity of running at 10,000 barrels a day, but it was difficult, and rarely necessary, to maintain that rate for 24 hours. Nevertheless, Pillsbury wound up with bragging rights. 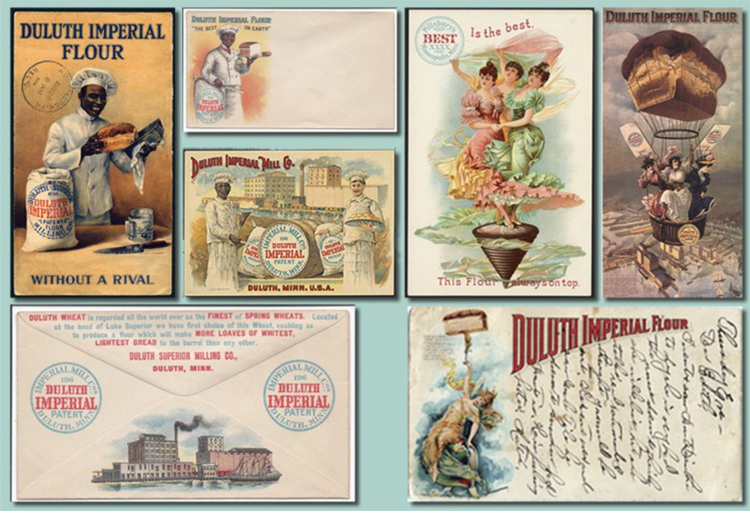 By 1895 at least nine other flour mills operated in Duluth and Superior, but their capacities reached nowhere near that of Imperial’s. And at the end of the century, only Minneapolis’s Pillsbury “A” mill could produce more flour than Duluth’s Imperial. Capital operated elevators #4 and #5 and leased the mill, first in 1905 to then-fledgling Minnesota Mining and Manufacturing—today’s 3M—who used four of the floors to manufacture “abrasive papers and cloth.” Later the F. A. Patrick Woolen Milling Company used the former flour mill to manufacture clothing. The former Imperial Mill was demolished some time in the 1950s. The exact date is unclear as most demolition permits kept by the city of Duluth were destroyed without making microfilm or digital copies. Elevator 5 was razed in 1977; the following January a spectacular fire destroyed Elevator 4 and badly damaged an iron ore steamer berthed next to the elevator in slip #1. The elevator burned for more than seven hours, and thousands of people gathered along Skyline Parkway and other vantage points to watch the remnants of the Twin Ports flour industry go up in smoke.